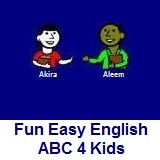 ﻿ Fun Easy English - new writing english alphabet for kids letter c.
Hey kids, try writing the letter C.
I brought a special clock home from Japan. Someday I want to drive a car. I went to the beach and saw a crab. Today there were clouds in the sky. The cats were playing on the floor.